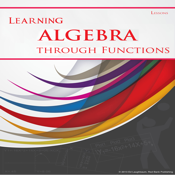 The 9 algebra apps linked to this catalog app contain a total of 81 lessons and 948 multiple-choice or open-ended questions. Upon answering a question in the linked apps, you receive a correct response and verbal confirmation if your response is correct. A score is displayed at the end of each lesson. This catalog app has a few sample items from each of the 9 linked apps. As you review the three (3) sample questions from each of the 9 linked apps, you need to be aware that judging one question may give a false impression of the lessons due to their pattern building nature in the linked apps. Looking at just two or three questions has the same outcome as trying to understand an “arm” by studying 2-3 cells in the arm. Please review the contents of the (?) at the bottom of the question screens in the sample questions.